If you make bacon, especially in large amounts, you might have grown tired of dumping all the grease that comes from frying it up. It’s not good to pour down the drain. And it’s a hassle and messy to throw it out…not to mention, a waste. 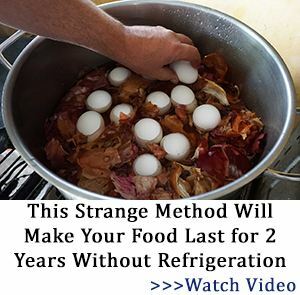 Sure, you can use it to cook up other food items. But then you have to use it relatively quickly and keep it safe and edible before use. Fortunately, there’s another option for extra bacon grease. One that is easy, practical, and affordable. Turn it into a great survival candle. How often does the power go out, or the batteries in your flashlight go dead without replacements nearby? All too often in my world, for sure. That’s when candles are very beneficial to have around. But, buying jar candles from the store can be quite costly, especially when the cost of making a bacon grease candle is minimal. Not only is the low cost very appealing, but they are incredibly easy to make. Bacon grease – The reason this should be viewed as no cost, is because you can use the grease of bacon you will be cooking up anyway. The grease is just a result of making it, so no additional cost. The jar – save old jam, baby food, or pickle jars rather than throw them out when you are done with the food item. Any size glass jar will work. String – if you don’t have any string lying around the house, this might be the only out of pocket actual cost, and it’s not much. I bought some for $1. If you want actual candle wick, that will run a bit higher, but still inexpensive. The strainer and funnel – most everyone has one around the house, and the strainer might not even be necessary. Pencil or toothpick – it will depend on the size of the jar on whether you could use a toothpick or pencil, but most homes also have a few of these around the house. And, when the candle is made, the pencil can be used again for its original intended purpose. So, you can see that it makes sense to make your own candles, especially you are using them for time of survival and necessity, rather than scent and decor. #1. Cut the string long enough to reach the bottom of the jar, to about 1” inch or more above the jar’s rim, leaving enough room to tie around the pencil or toothpick. #2. Tie the string around the pencil or toothpic. #3. Place the pencil or toothpick across the top of the jar, so that the string reaches the bottom of the jar. #4. Cook the bacon as you would for consumption. #5. Strain the bacon grease, if necessary. I did not need to strain it, because there weren’t any noticeable or large residual pieces left behind when removing the cooked bacon from the grease. #6. Put the funnel on the jar and slowly and carefully pour the grease into the jar, around the string. #7. Place the jar of hot grease in a cool and safe area to cool down to room temperature. #8. Once the jar cools, place in the refrigerator to harden the bacon grease. #9. Once it’s firm, cut the string low enough that it falls below the rim of the jar. This is important so that it does not fall outside of the jar after it’s lit. #10. It is now ready to use. When it’s not in use, place the lid on the candle and store it in a cool place. You can make the candles as large or as small as you desire, as long as you can find a jar with a lid. I made a small candle for demonstration for this article only. I normally would make them larger than this, but that requires cooking up more bacon than I am comfortable eating at one time! However, to make larger bacon grease candles, the only difference would be time. 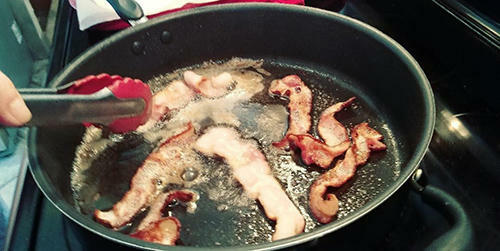 Start the candle with the grease from the first batch of bacon you make as instructed above. And store the jar in a cool place. 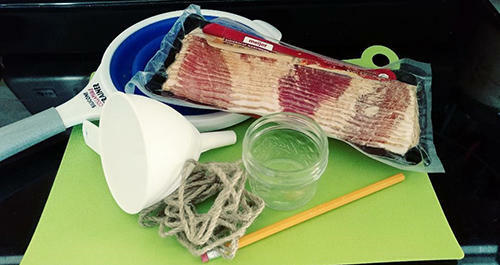 Next time you make bacon, add the grease to the jar, and repeat each time you make a batch, until the jar is full. As mentioned earlier, when the candle is not in use, make sure to keep it covered, for two reasons. If it gets too warm, it could soften up too much and you could end up with a mess. But also, you don’t want to attract critters and insects from the aroma of bacon grease. why waste bacon grease on a candle? I save the bacon grease every time we cook bacon. I store the jar in the freezer, which means the bacon grease pretty much keeps forever. Whenever cooking calls for a good fat that can take high heat, I use my stored bacon grease. It works great for any pan fried / pan seared dish, adding additional flavor, and also reduces the amount of salt I need to use. In a SHTF situation, it can be used to add much needed calories to potatoes, rice, etc. Seems like a waste of high calorie fat. Save your crusts of bread if you don’t eat them. Dry them in the oven or a food dryer when you have enough to make a batch. Store them in either a jar or vacuum seal them if you have a vacuum sealer. When the EOTW comes around, soak the bread in warmed enough to melt bacon grease. You have a high energy food. Fat for long term energy and carbs for immediate energy. Plus it tastes good. According to Frank McCourt that was a staple of the diet of poor urban Irish in the years before WWII. It could also serve as a take away meal for those who come to your door begging for food if you are of a charitable mind who feels you must provide for those who failed to provide for themselves. One thing…bacon grease actually lasts quite a while. 6 months or so at room temperature, a year or so in the refrigerator. All that being said, I do seem to get more bacon grease than I use, so aside from freezing it for the unknown future, this looks like another potential use for the grease. Besides, if you have these around and need them for cooking or eating, you have them..
Yea all the comments here about using bacon grease I seem to agree with. But one thing to point out here. If just if your in a situation where all you have is bacon grease to light your night. At least you know that pig fat makes candles. Yes if I was way out in the boonies with only pigs and veggies to eat. No electricity I’d have two storage jars. One for cooking with and one for candles store it half and half. Neat idea. But I can my extra bacon grease for future use. Just strain and heat then put in canning jars. Put a hot dried off lid on and seal. It will stay great for several years. I do this all the time. Almost any kind of oil or grease will make a fire. I am not talking about petroleum based oils. They will too, but some of their by-products are not too healthy. Peanut oil, canola oil, corn oil, olive oil, walnut oil, avocado oil, all of the vegetable oils will burn and give off light. You can insert wicks in a can of Crisco and they will burn and give off heat and light. A 3-pound can of Crisco with three wicks in it will give off heat and light for a long time. I am sure store brands of shortening will do the same. Our forefathers used tallow candles. Tallow is beef or sheep fat that has been rendered. Lard is pig fat and schmaltz is chicken fat. I believe schmaltz also covers duck fat. All of those substances can be made into candles. In an early discussion on oils and fat, one of the posters pointed out that if your fat has become rancid or moldy, it can still be used for lighting and heating despite the fact that you might not want to eat it. In the tests I conducted and reported on here on this list, I pointed out that all of the oil lamps smoked quite a bit and if you used them inside, your walls, ceilings, drapery etc would soon become blackened with the smoke the oil lamps gave off. OTOH, in an end of the world situation, soot covered walls might be the least of your problems. Make your own string from natural plant fibers . My personal choice is “dogbane” which grows naturally in my part of the world . This way your cost is zero . I always enjoy these articles. They bring out food for thought and an abundance of ideas from others that multiply into a plethora of experiments to try in the field. I have access to a very large wooded and prairie style acreage to experiment on and no one to say “You cant do that”. So many of the ideas here are field tested in all kinds of weather including the -16F temps we had here recently. Of course the biggest experiment is keeping warm at -16F with windchills of -60F. Nature teaches quickly and can be very unforgiving so try out the shtf techniques then move to doing them in the extreme conditions. It truly is fun to learn how to live with Mother Nature and rely on Mother Earth as your Teacher and Provider. Just bacon grease or can all cooking fat grease work? All fat will burn. Grease fires are a major cause of home and restaurant fires. I would not mix the fat. In other words, I would keep pork fat with pork and beef fat with beef, chicken with chicken. I can’t give you a specific reason for doing so, It just seems logical that mixing different kinds of grease might cut down on their shelf life. Of course, my comment is subject to significant revision should someone who really knows post a knowledgeable reply. As I mentioned earlier, I performed some burn rate experiments with as many inexpensive oils as I could find at Smart & Final and they all burned equally to visual observation and similar amounts burned for similar time spans according to rather loose standards. I didn’t time the time I actually started the candle and I didn’t time when I put it out, but they burned the biggest part of a summer day. I started them sometime in the morning and put them out when I buttoned up for the evening. They all still had oil in the tuna fish can when I put them out. They all smoked visibly. There was an odor only when they were first starting out. After the oil heated up, I couldn’t detect an odor. This was outside and using only my nose as a detection device. I don’t think my tests would stand up to rigorous peer review. I was satisfied that any kind of cooking oil, using a t-shirt hem as a wick would provide enough light to navigate around a room with; not quite enough light for doing eye or brain surgery. You could probably stitch up a cut by the light if the lamp were close enough. You could read with it, again if you were close enough. The light is equal to perhaps a single old-fashioned christmas tree light if it were orange. I agree with Left Coast Chuck on not mixing the different fats to make candles. Some research on the different melting points and smoking point temperatures of meat fats and vegetable fats are indicators of different fat break down and ignition into flame points. Those different temperature points may cause some problems with the burning of candles. My suggestion is take up Beekeeping and spend the time with nature and bee (lol) rewarded with honey and some great quality beeswax candles. If your not wanting honey and beeswax, learn how to make candles with paraffin and stearic acid Your Doctor will be happier if you use the money to skip about 3 lbs of bacon and make candles. I think 3 lbs of bacon money will make more candles than the bacon fat. The process for Wax candles is almost identical to Bacon candles. Only melt the wax in a double boiler add the proper amount of stearic acid and proceed just as the Bacon candles would be made. Warning- Do Not Fry the Paraffin and Do NOT heat in a regular pan or pot, it can get to hot and Start on Fire. Always melt wax in a double boiler. If you want some color to your Wax candles, add blue and yellow crayons let melt and stir gently so you get color streaks or stir completely and get a green candle. Don’t worry the kids will get over missing the crayons. Remember – always enjoy being a Prepper. Liquid cooking oil would not work for me last month when our electricity was out for 4days. Tried it every night in oil lamp. Gave it a chance the 1st to soak up the wick, but 2nd night, it still would not burn. When I talk about an oil lamp, I am talking about something like Aladdin’s lamp, just a wick stuck in some kind of cooking oil. A chimneyed “oil lamp” burns lamp oil only. Lamp oil is a highly refined paraffin oil that burns cleanly in an oil lamp. I used the hem of a 100% cotton shirt for my wick. You can’t use material with any artificial fiber in it. You must use 100% cotton. I used a tuna fish can, saving the lid as a snuffer. It had a pull tab, so that made a nifty little handle. I cut strips of cardboard just wide enough so that it fit below the edge of the tuna can. I wound enough cardboard into the tuna can so that it held the hem of the t-shirt up about an inch to an inch and a half in the air. I then filled the tuna can with the oil that I was testing and waited about an hour for the wick to absorb the oil. The first lighting took two paper matches to get it burning. After it was charred a bit it started burning with only one paper match. As for your chimneyed oil lamp, you need to replace the wick. Don’t throw it away, it can be used as the wick in the tuna fish can oil lamp I described, but it won’t draw the lamp oil up from the reservoir. You need to clean all the vegetable oil out of the lamp. I would use isopropyl alcohol to clean it. IPA is a degreaser. It also is not as flammable as some other degreasers. Let the IPA dry thoroughly so that there is not a trace of it anywhere in the oil lamp. Replace the wick with a new wick. Don’t fill the fuel bowl all the way. You have to leave room for expansion of the fuel as it warms from the flame of the lamp. Extend the wick about an inch above the holder and let it sit for about an hour or more. When it is damp with the lamp oil, it should light with just a couple of matches. It may need to char just a bit to get an easy light. You can buy lamp oil from restaurant supply places or probably from Amazon. You could probably also burn K-1 kerosene. You have to be careful with kerosene too. You only want to burn K-1 inside the house. K-2 and lower grades are primarily for outdoor use. They smell of kerosene too strongly when used indoors. Everybody in the 18th century knew how to light oil lamps. It is a bit of every day early life that a lot of folks in the U.S. just don’t know about. Occasionally you will need to trim the wick. You will also need to clean inside the glass chimney. Be careful after you put out the light as it will still be hot and can burn people and things. I would put something under the lamp before burning it on a flammable surface or some surface you might not want scorched. The bowl will get warmish the longer the lamp burns. I thought I had taught my son about fires and flammable liquids, but either I didn’t do a good job or he didn’t pay attention, after all, what does Dad know? The first time he went camping with his children the campfire didn’t look like it was catching fire fast enough, so he threw a cup of white gas on it. Luckily he didn’t burn the grandkids and only scorched off his eye lashes and eyebrows and nothing else. I couldn’t believe it when the grandkids told me about their dad and the fire. Well, at least they learned the lesson their dad didn’t. Don’t wait until the electricity goes out before you repair the lamp and try again. It’s always better to find out where the alligators are before you enter the swamp. I buy lamp oil at Wal-Mart in 1/2 gallon jugs. Sometimes dollar stores have it in 12 or 16 ounce containers. I found out our local Wal-Mart only stocks lamp oil in the summertime. People use it in the summer for tiki torches and patio candles. Nobody uses it in SoCal during what passes for winter out here so the local Wally World sends it back to the warehouse until summertime. I haven’t thought to check the dollar store, although I suspect they do the same thing. Oil lamp refers to coal oil or kerosene. You can also use lamp oil in one. It lights fairly easily. I didn’t go into it my post because it was already long enough, but the paraffin based lamp oil is the cleanest burning oil. It also releases the lowest number of BTUs when it burns, so it give off less heat and less light than K-1 and the other kerosenes. K-1 burns cleaner than K-2 as I indicated. It contains more BTUs per unit than lamp oil. It gives off more heat and light as it burns. K-2 has more BTUs than K-1 etc etc etc. I always thought kerosene was kerosene. When I started to explore oil lamps and what to use in them, I found out the whole topic was a lot more involved than I had ever thought. If you go to the Aladdin website, the folks who make a large line of oil lamps, you will find more information than you can digest in one setting on oil lamps and the oil that goes in them. I would recommend perusing their website if oil lamps are in your plans for post EOTW lighting. No thanks. Will stick to paraffin wax for now. Will reuse bacon grease for cooking. You can burn most fats with a wick in a somewhat open bowl. But I bought 60 lb of soy wax and a bunch of commercial wicks. Much easier than bacon fat and my husband loved milk gravy made with bacon fat over some good buttermilk biscuits. I don’t buy much bacon so candles or oil lamp from bacon fat isn’t going to happen. Now the old Crisco I found when cleaning out my parents old place would be fine for use as a lamp or candle with wicks stuck in it. I make wax candles. I used to teach wax candle making as a craft class for teens. Some sand cast and some in molds. Scents, colors and assorted additives to create different effects. Treated cotton string and paraphin would do well enough. I also buy up old bent or broken candles at yard sales. Cheap and just fine is all you want is light or heat. Pretty is a whole different subject. Old candles can be melted and poured in a small glass or a cup. The partly burned wicks can be used in new candles it they aren’t too tall. Or make a well in damp sand and pour in melted wax. Add a wick and when the wax is firm you’ll have a sand bowl with a candle in it. They can be freeform and quite attractive. Wax or paraffin have melted crayons added for color. You can use a waxed paper milk carton with ice cubes in it. Tie wick to a pencil and lay across the open and fill with melted wax. It make an interesting looking candle. It can be as much fun as it is practice.